SHIPPENVILLE, Pa. (D9Sports) – Starting this year, D9Sports.Com and All American Awards & Engraving will add one of District 9’s most successful natives to its basketball Coach of the Year awards. 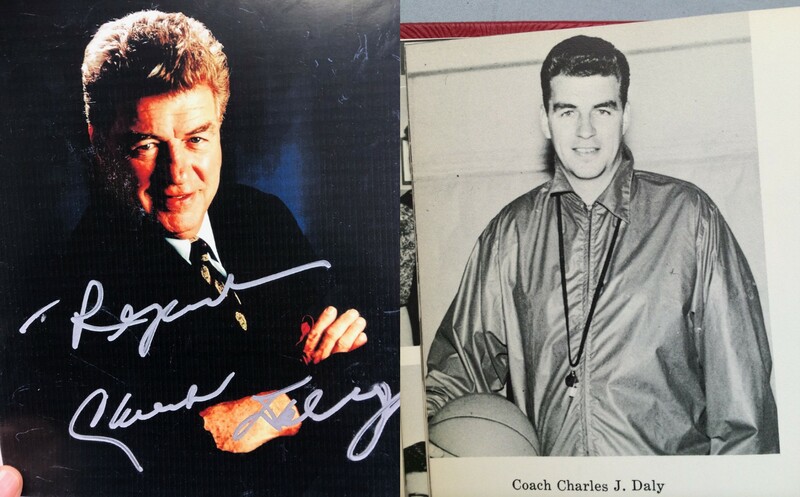 It’ll include the name of Kane native Chuck Daly, a James Naismith National Basketball Hall of Famer who started his coaching career at Punxsutawney High School before moving into the college and pro ranks where he won two NBA titles with the Detroit Pistons. Daly also coached the 1992 United States Olympic “Dream Team” to a gold medal finish. It’ll be called the Chuck Daly Coach of the Year award — for the top boys’ and girls’ coaches annually in District 9 — as presented by the Chuck Daly Foundation, which was formed in Punxsutawney in 2016 by 1960 PAHS graduate George “Butch” White, who played basketball under Daly. The foundation was formed primarily to create scholarships for both male and female student/athletes in both basketball and golf. It’s the second D9 native who’s in a Hall of Fame that’s on a postseason award. In 2014, East Brady native and Pro Football Hall of Famer Jim Kelly’s name began to be used on the award that honors the D9’s football Most Valuable Player each fall. Just this year, the Daly Foundation started a traveling trophy that’ll be contested for annually by the Brookville and Punxsutawney boys’ basketball teams — the Daly-McManigle Trophy. It recognizes Daly and longtime Raiders coach Larry McManigle, who forged a close relationship coaching against each other in the late 1950s and early 1960s. Daly, who died in 2009, was a Speech Teacher who coached basketball and golf at Punxsutawney from 1956 through 1963. He won 111 games in eight seasons, coaching the Chucks to a district title in 1958 and league championships in 1958, 1962 and 1963. From there, he moved into the college ranks as an assistant at Duke University — joining head coach Vic Bubas’ staff that also included coaching great Hubie Brown, a current NBA analyst on ESPN. His first college head coaching job was at Boston College for two seasons after replacing former Boston Celtics great Bob Cousy. Daly won four Ivy League titles in six seasons with University of Pennsylvania before landing in the NBA ranks for good as an assistant with the Philadelphia 76ers from 1978-81. His first NBA head coaching job was with the Cleveland Cavaliers, albeit a short and struggling one after getting fired following a 9-32 start to the 1981-82 season. So it was a surprise when Daly landed in Detroit two years later as the Pistons coach. He wound up going 467-271 in nine seasons with the Pistons, who, as the “Bad Boys”, won NBA titles in 1989 and 1990 after reaching the Eastern Conference finals in 1988. Daly coached the arguably the greatest collection of basketball players to the gold medal in the 1992 Summer Olympics in Barcelona, then moved on two other NBA stops at New Jersey and then Orlando, where he finished his career in 1998-99, the Magic winning the Atlantic Division title in the strike-shortened season. Daly was inducted into the Hall of Fame in 1994 and the NBA continues to honor his coaching legacy with the Chuck Daly Lifetime Achievement Award given annually to a longtime NBA coach’s life in basketball and his “standard of integrity, competitive excellence and tireless promotion” of the game. Daly’s former fellow staffer at Duke, Brown, won the award in 2017.